One of the most visited sites in Kyrenia, North Cyprus. Rose Macaulay was one of a string of famous literary giants to visit North Cyprus and St Hilarion castle is remembered in her book 'Pleasure of Ruins' published in 1953. 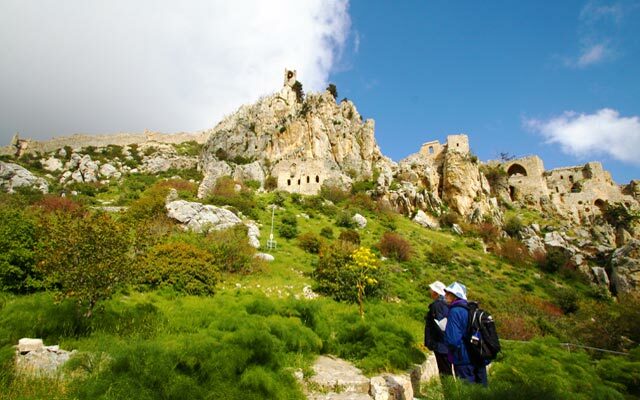 She evocatively described St Hilarion as 'a picture book castle for elf kings sprawling over twin crests with its maze of gate houses, courts, arches, kitchens, cisterns, church, vaulted chambers and halls, terraces and steep flights of grass-grown steps'. At 732m, the castle straddles and sprawls around twin peaks, the very location where Hilarion decided to seek solitude in the 4th century. Known to work miracles, he escaped his persistent followers in this isolated place. A monastery dedicated to him was built here in the 10th or 11th century. The castle was built by the Byzantines around 1110 and over the next couple of centuries it was under siege more than once and not always able to resist. Later it was used as a summer palace by the Lusignans who added royal apartments. The Venetians, fearful it might fall into the hands of their enemies, decommissioned the castle and partly dismantled it. The castle is reached from the main Kyrenia (Girne)-Nicosia (Lefkosa) road where a paved road leads up to a small car park by the entrance. Once through the gate house, you enter the lower ward which was reserved for the garrison and their mounts. One of larger stables here now has a pictorial history of the castle. Following the path still leads up to the middle ward and the 10th century Byzantine church on the right which was partially restored in 1959. Steps lead down from here into the 14C great hall which replaced the monastery’s refectory and the kitchen quarters. The upper ward, reached by a steady climb up steps, leads to the royal quarters. On the west side are three beautiful Gothic windows and the one with stone seats is known as the Queen’s window. The final climb up to Prince John’s Tower is one for the agile, once up it is hard not to notice the precipitous drops on three sides. From here, it is said, three Bulgarian mercenaries were thrown to their deaths for plotting treachery.